Dr Jai Sungaran is a dedicated Hand & Wrist surgeon with a special interest in the management of sporting and military injuries. He treats all conditions of the hand and wrist, ranging from arthritis and fractures through to complex reconstructive microsurgery and peripheral nerve surgery. 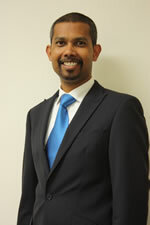 After graduating from the University of NSW in 2000, Dr. Sungaran began surgical training in 2002 and obtained his Orthopaedic surgery Fellowship qualifications in 2010. He was awarded the Johnson & Johnson Medical research scholarship in 2011 to undertake further training in Hand & Wrist surgery. He successfully completed a Masters in Advanced Surgery under the guidance of Prof. Graham Gumley and travelled overseas to gain further experience in microsurgery and peripheral nerve surgery. Dr Sungaran is available for acute hand & wrist trauma including lacerations, work injuries, amputations and replantations requiring microsurgery.